I'm beginning to see a pattern in Nigel Lythgoe's directions. Open the show with one of the weird auditions or reactions, then start it off formally with several good singers, highlight some really good ones, then change the flow and declared the city turned "to the dark side" or some other pun. Follow that with a few more better singers and then end with a good enough singer with a heart wrenching story. Aaaaaaaand that's a wrap America! So this week, Nigel shook it up a bit and began the auditions with a terrible one. Nice going Mr. Lythgoe. Lauren Alaina, the next Carrie Underwood? Christine McCffrey was awesome. Haha! Steven Tyler: "I'm gonna say NO." Christine: "Awesome!" Rob Bolin and Chelsee Oaks were exes singing together for American Idol. Both of them could sing, although I noted Chelsee sounded much better or chose a better audition song, but when they were singing together it kinda gave me chills. Maybe because of their back story or maybe because they sing well together. Allen Lewis I can imagine drunk and singing really well on karaoke. He was surprisingly humble about the whole deal of not getting a "yes" though. Gorgeous Miss Teen USA 2009, Stormi Henley sounded squeaky like a chipmunk. Jennifer Lopez refused her while the 2 guys let her through. I would have said yes to her as well, this competition needs some commercial appeal! Hehe! African American Adrienne Beasly lives on a farm with her adoptive Caucasian parents. She sounded really raw, I don't know how far in the competition she can go. I think 5' 2" Kameela Merricks can sing, but she's trying too hard to impress the judges (even chose a Chaka Khan song) and ended up singing way above her range. She shouted the whole thing. I would have asked her to sing something in a lower range just to show her she could, but then I would've still said no. Jackie Wilson, a singer by profession, was really nervous. I can imagine what must have been going through - knowing that you CAN sing means if you don't make it past, it's all on you. but she hit her high notes well. Latoya "Younique" Moore had a really unique sound. If only she hit her notes properly, sang "cleaner", maybe she could be better than she did. She needs to change her attitude though before she can improve. Paul Macdonald sounded current if a bit boring. Matt Dillard is not good enough for American Idol. He has a good heart but not a good voice. He shouldn't have gotten through. 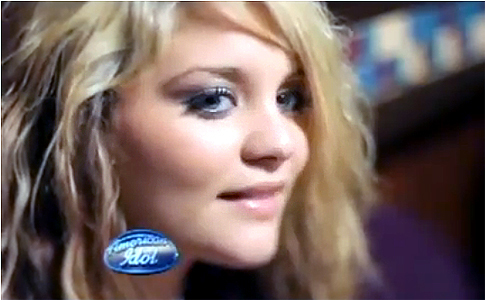 Georgia's 15-year-old Lauren Alaina sounded like a crossover country singer. Could she be the next Carrie Underwood? I don't think they announced how many received a golden ticket Next week it's off to Texas!